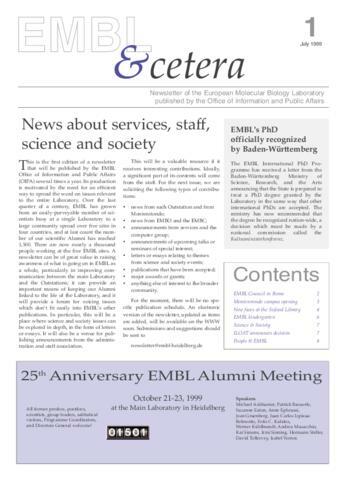 News about services, staff, science and society: an introduction as to why EMBL &cetera was created. EMBL's PhD officialy recognised by Baden-Wurttemburg: the Phd degree granted by EMBL is now accepted like other international PhDs. 25th Anniversary EMBL Alumni Meeting: an advertisement for the alumni meeting taking place on October 21-23, 1999 in Heidelberg, DE. EMBL Council descends on Rome: the EMBL Council meeting took place in the new Research Programme in Mouse Biology in Monterotondo; the Scientific Programme was approved and the Council voted to approve the financial recommendations; announcement of the Host Site Agreement signed with the Italian government; list of presentations from Walter Witke, Ulrich Kalinke, José de la Pompa, Klaus Rajewsky and Glauco Tocchini-Valentini. Photographs: Italy’s President Oscar Luigi Scalfaro (at right) attended ceremonies inaugurating the new campus and the Adriano Buzzati-Traverso campus in Monterotondo, Italy. Monterotondo campus opens its doors: Opening of the new EMBL Research Programme in Mouse Biology on 8 March 1999 at the "Adriano Buzzati-Traverso" International Scientific Campus, in Monterotondo, Italy. List of goals, representatives and other campus hosts. Photographs: Klaus Rajewsky and Fotis Kafatos at the inaugural reception, and Glauco Tocchini-Valentini. New faces at the Szilard Library: Description of improvements for the Szilard Library. New librarians: David Westley and Regina Herhoff. Quote from Mary Holmes referring to the beginning of Szilard Library. Photographs: Librarians Regina Herhoff and David Westley. EMBL kids get a new stomping ground. Photogaphs: various views of the new Kinderkrippe and Kindergarten building. Science & Society: Announcement of the next Seminar. Speaker: Professor Jürgen Mittelstrass. Title: The Impact of the New Biology on Ethics. Date 19 September 1999. ILO decides on salary adjustment for 1995: Claim to EMBL Council to remake the salary adjustment. Obituaries: Alexandra Freiburg (1971-09-10/1999-07-14) and Paolo Fasella (1930-12-16/1999-06-11).